Just to confuse international as well as domestic tourists, the domestic airport at Proserpine is called Proserpine Airport or Whitsunday Coast Airport depending on who you fly with. 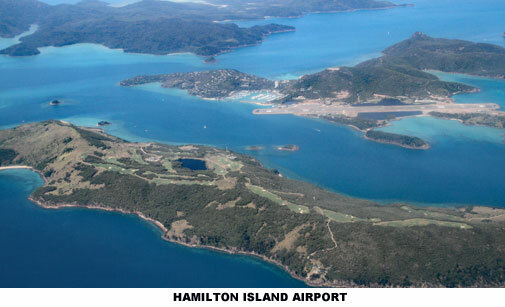 To add a little more confusion for the traveller there is another domestic airport at Hamilton Island which is located in the Whitsunday Islands 19km from Shute Harbour. Shute Harbour is a further 11 km from Airlie Beach. Got all that. If you are arriving from overseas generally you will fly into Melbourne, Sydney, Brisbane or Cairns and get a domestic flight with Tigerair, Virgin, Jetstar or Qantas to the Whitsundays. Neither Hamilton Island nor Proserpine/Whitsunday Coast Airports are International Airports. Proserpine/Whitsunday Coast airport is not accessible via Cairns. Hamilton Island airport, on the other hand is accessible via Cairns. Proserpine/Whitsunday Coast airport is about to commence a $40 million upgrade which will mean more flights into the region and much greater potential for an international airport in the future. Offering passengers a comfortable and scenic way to view the inland coast of Queensland, the Sunlander travels return from Brisbane to Proserpine - near Airlie Beach, three times per week. The Sunlander meanders its way through the scenic, lush countryside of inland coastal towns of Bundaberg and Gladstone through to the sub-tropical region in Mackay, Proserpine and Bowen, until reaching its final destination of Cairns. Passengers can travel in first or economy class sleeping berths and seating is also available. Waterways Restaurant also provides an excellent array of sumptuous meals accompanied with quality Australian wines, as well as a licensed buffet car. 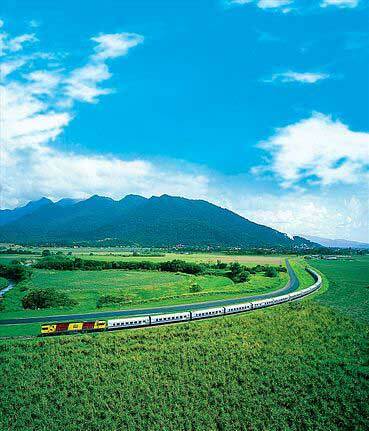 For a totally relaxing and unwinding experience, this multi award-winning train offers the passengers, an ideal way to experience the picturesque coastal stretch between Brisbane and Cairns, in comfortable, fully air-conditioned lounge cars, club cars and dining facilities. Making for a leisurely 31-hour journey, The Queenslander offers first class travel with comfortable single or double sleeping berths, overhead reading lights, washbasins, fresh crisp linen, stationery packs, toiletries and bathrobes are provided in each cabin. Sumptuous meals are presented in the fine dining atmosphere of the Coral Cay Restaurant, while the Daintree Lounge provides the perfect place to wile away the hours with a cool drink and live entertainment. Queensland Rail's brand new Tilt Train fleet was launched in October 2013 and focuses on relaxation, comfort and modern facilities. Connecting visitors to major tourist destinations from South East to Central Queensland, the new Spirit of Queensland train boasts an Australian first, the revolutionary seats that convert to a lie-flat bed. 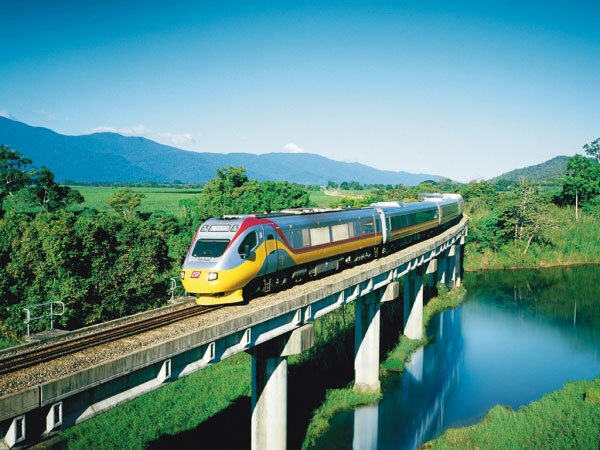 As Australia's fastest train, this service operates in each direction between Brisbane and Cairns and is outfitted with state-of-the-art facilities and catering. Providing a smooth and comfortable ride, the Spirit of Queensland is perfect for day trips and a wonderful choice to explore any of the amazing spots along the Capricorn and Coral Coasts including Fraser Island, Hervey Bay, Rockhampton or the Whitsunday Islands. Offering the same journey as the Sunlander, only within 24 hours. You could hire a car from another city and depending on whether the facilities are available you can drop it off to the same provider when you arrive in Cairns. Coach travel is an efficient and pleasurable way to see the countryside. Major coach companies operate luxury, air conditioned vehicles with express services between major Australian cities and Airlie Beach.